This adventurous kitty is the new mascot for a local public art walking tour for families and children. His nickname is T-CAT, short for Traverse City Art Trek. He will appear on the soon-to-be available map and brochure from the visitor’s center this summer! The Traverse City Art Trek is a stroller-friendly walking tour that covers just a few city blocks and passes by shops and historic buildings, then crosses over the scenic Boardman River, and loops back to the waterfront. Participants will encounter works by local artists and learn a little bit about the city as well. Follow me to find art around my city! If you’re not familiar with Traverse City, we are a popular destination, making the Best of lists for beaches, natural beauty, wine, and livability, just to name a few! It’s been fun working with this all-volunteer committee to make this a reality. It’s my first time doing illustration work for anyone other than myself, and I’m proud to contribute. If the TCAT has a successful launch, we will proceed with plans to expand the tour outside of the downtown area, and include bike paths and other locales in the city. The ornaments on my tree all have an origin story. Some belonged to my mother. Others were made by my husband, or by me. Many more were gifts from friends or former students. Each decoration has meaning, and evokes the giver, the event at which it was acquired, or the location of purchase or creation. The Christmas tree, then, becomes a receptacle of memory, representing the strata of my life, and that of my family. Do not eat. Not a real cookie. As a cat person, I receive a lot of cat Christmas tree ornaments as gifts. This one, though, I purchased myself while celebrating a birthday dinner on a riverboat in Hannibal, Missouri. (Yes, the Hannibal that is famous as being the hometown of Mark Twain.) I liked this cat for the whimsical arch of its back, and that it looks like a frosted gingerbread cookie. I’ve been staring at it ever since our tree went up a couple of weeks ago. This morning, I was compelled to document it. I just want to say Merry Christmas and Happy Hanukah to everyone, if that’s your thing, and, at the very least, Happy Solstice! This is as dark as it gets in the Northern Hemisphere. Be warm, safe, and thoughtful this holiday. On Sunday nights I used to help feed feral cats who lived in managed colonies not far from my neighborhood. There were four stops, and on any given night, I might see from 5 – 30 cats who came to the feeding areas for food. There were a few cats who would get close enough for a quick scruff, but the majority of them would hang back until the food was in a dish. My Inktober interpretation for SAD is based on my experiences with the colony cats. I would worry on nights when I didn’t see a regular visitor, or if a cat was clearly in distress. But, at the very least, these cats were spayed or neutered, and got a meal once a day. Occasionally, there would be a sick or injured cat, who, if it could be safely trapped, received health care. When kittens did show up, they were carefully captured, and placed in forever homes. I dedicate this drawing to all of those scrappy cats who survive in the streets, around dumpsters, drainages, and parking lots. Random objects usually go on a shelf in my studio where they pile up as remembrances of people, places, or events. I used one such corner as inspiration for Day 3 of Inktober. The treasures on this shelf in my studio were given to me by friends, relatives, and former students. The oldest item on the shelf is the cloth clown that I got at an art fair 20 years ago! The waving red cat, the blue sparkle cat, the giant black bird, and the can of soup all came from students. Every object here has a story that helps construct my memories. A trinket from the fair. A little souvenir. Small gifts from friends. Do you have a collection of such things? Last year, I participated in Drawlloween, a challenge for artists to post a work every day for the month of October based on Halloween themed prompts. Despite my most sincere efforts, I can not draw anything that looks really scary, but, I proceeded anyway, rendering my subjects in watercolor and pen. You can look back on my interpretations starting with Drawlloween with Cats, where I present the first four drawings I completed, including Return from the Dead, Mansions and Manors, Spider Day, and Better Homes & Goblins. I contemplated joining in the spooky fun again this year, but, instead, opted to do Inktober, which follows a similar format by providing daily drawing prompts. Inktober is decidedly non-seasonal, and the only rule, really, is that the drawing must be executed in ink. I find the discipline of using pens quite appealing, and I admire artists who do fine inking work. My favorite of all time is Edward Gorey, but a recent find is the illustrator Franco Matticcio. Both of these artists employ fine, directional marks, layering, and a variety of patterns and textures to create contrast and build form. Their drawings are also whimsical, and they both draw cats, among other things. Across the board, interpretations of these prompts varies wildly, with incredible artists submitting their works. It is SO inspiring and fun to see what other people draw. You can see what other artists are doing by searching #inktober and #drawlloween on any social media site! Already a couple of days behind the Inktober schedule, posts will arrive as I complete more drawings. When I work on illustrations of cats, I use a reference because I’ve never been an artist who remembers the details of an object from my imagination. A lot of times, I can work out the surroundings, or take a quick look at something, say, a table, and draw it. But, for the main subject, kitty!, I usually work from a photo. I like photos not so much because I want to capture every whisker, but more because there’s usually the placement or angle of a pose that I want to capture. My sweet, long-suffering Emily was just waiting for me to finish working in the studio one night when I took this shot. Later, I used it as inspiration for the painting on the right. For my holiday series, I first come up with the idea for the composition. Then, I search through my hundreds (literally) of cat photos for the poses that I think will best fit my idea. On the rare occasion I don’t find what I am looking for, I might go in search of a willing model, but it’s hard to get a cat to pose! That’s why I take pictures frequently to use for reference later. That way, I almost always have the exact look I want. On the left is an example of the drawing I made for the finished painting on the right. In the beginning, I block out the composition in pencil, finally adding the details with watercolor, and sometimes adding in pen for contrast and definition. I have quite a collection of Christmas Cats at this point. So, I thought I would have some of them printed on greeting cards. I use a local printer who works with me to accurately represent the original color when translated to the digital reproduction. I’m so happy with how they turned out, that I decided to offer them for the first time in my Etsy shop and at the local holiday markets! My collection of Christmas Cats! You can find them at Etsy, or just send me a private message for special orders. Finally! As Drawlloween is almost ended, I’m excited for the Skulls and Skeletons prompt! 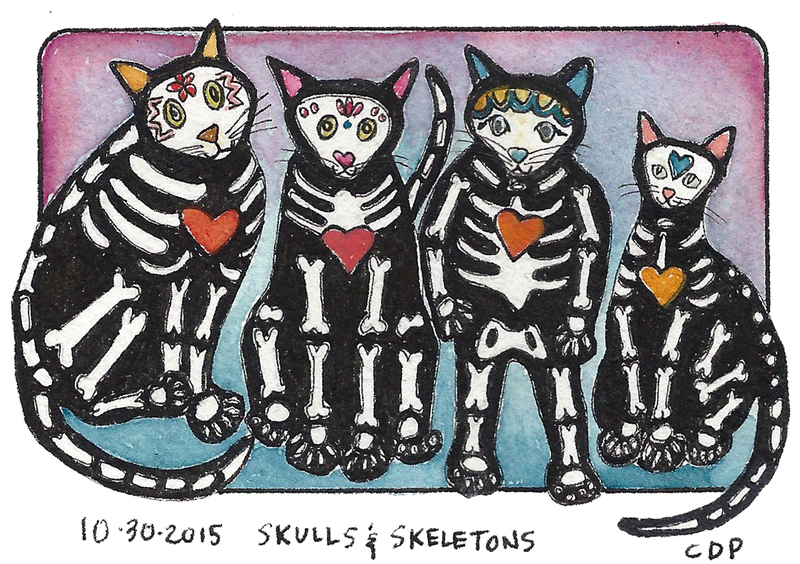 With this Dia de los Muertos tribute, (the Mexican Day of the Dead,) I celebrate the nine lives of Cleo, Emily, Garfield, and Spooky, by memorializing them in this drawing of hearts and bones. Stylish ghouls. Let’s go, already! 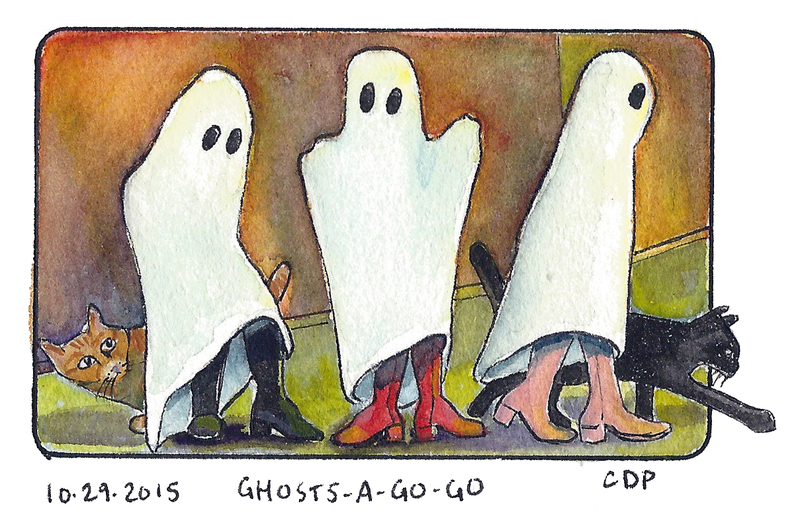 The Drawlloween countdown continues. Only two more to go! I know next to nothing about World of Warcraft. The closest I come to video games is playing Scrabble on Facebook. 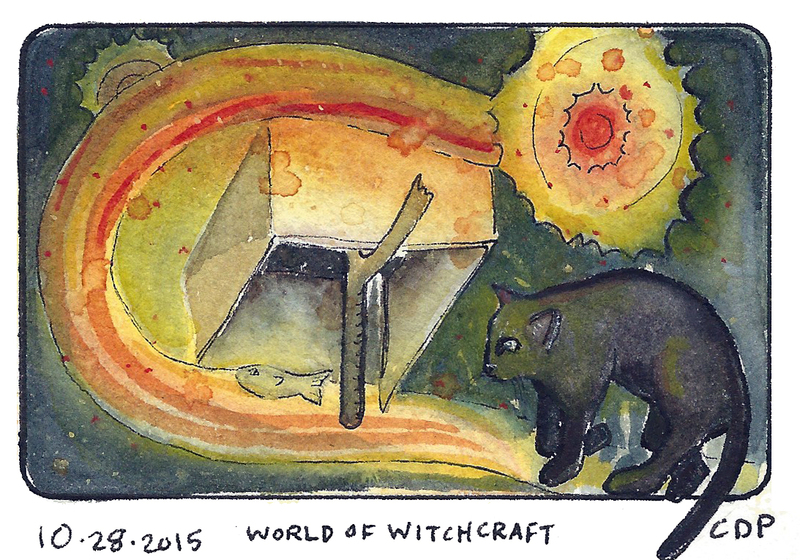 So, when the Drawlloween challenge was World of Witchcraft, I had to do a little exploring into it’s legitimate and, oh so popular referent. I respect you if you’re a W.O.W. enthusiast, but I just couldn’t embrace the theme and how to impose a kitty. That is, until I found the Pet Battle link. Apparently, in this part of the game, your character collects animals by trapping them, and then turning them into warrior pets. There are also a lot of magical orbs, so… anyway… I expose my ignorance, and give you my version. Cats love a good fish in any realm. Powerful and mysterious, the moon tugs at the oceans, determines our calendar, and causes mischief when we see the sun’s reflected light during the full lunar cycle. I always welcome that illuminating glow and the moon’s transformative luminosity. The succession from full, to waning, to half, to waxing is a comfort and a beacon, connecting me to my friends all over the world because we all gaze upon the same moon. 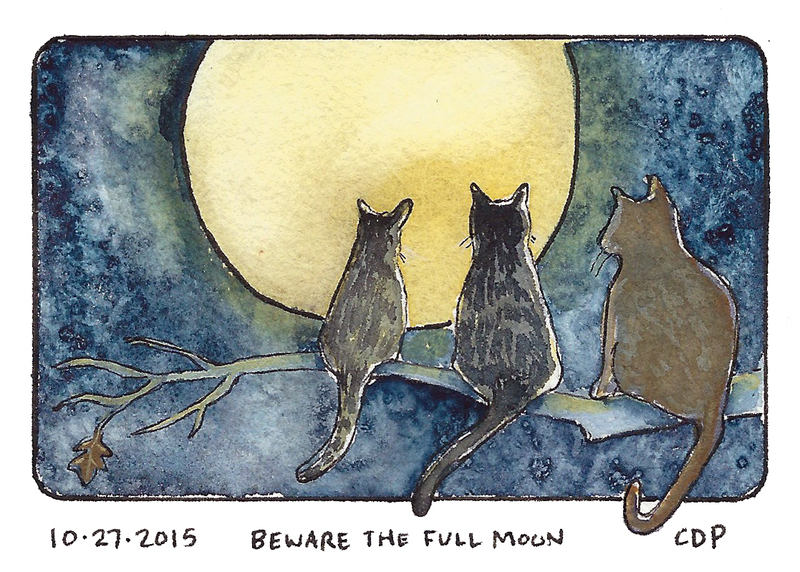 So, today’s prompt, Beware the Full Moon, is more like an invitation for contemplation than a warning against danger.